Each year, my kids and I choose one special dessert to make around Easter time. 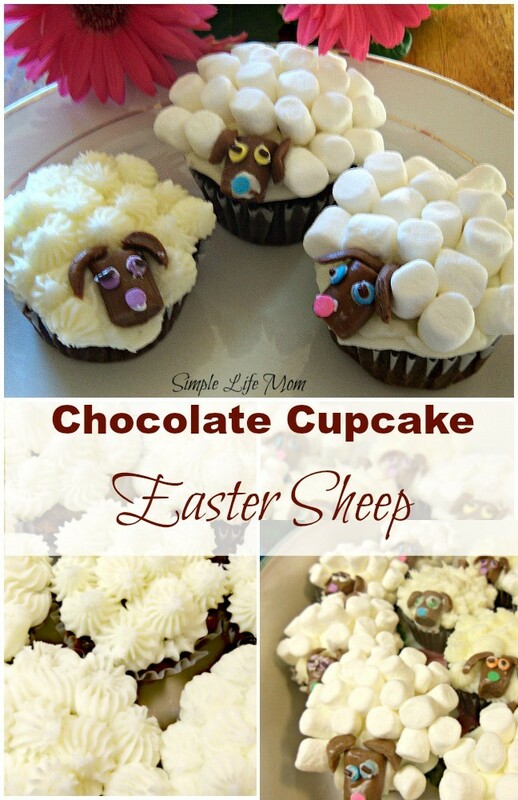 Easter goodies this year: Chocolate Easter Cupcake Sheep! 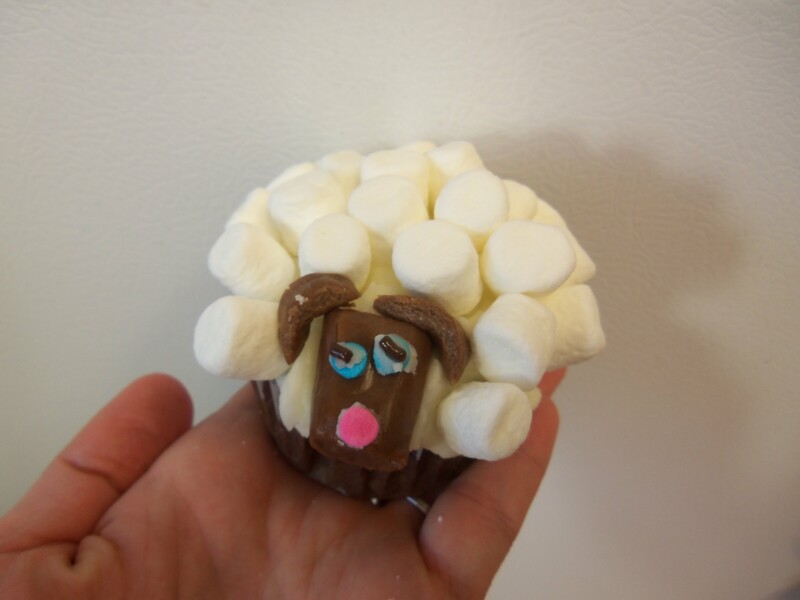 This year my kids asked me how I could make a cupcake look like a sheep. It’s not exactly healthy, not at all…but we do not eat things like this too often. Well, this is what we came up with. They worked very hard and were so proud of the outcome. Notice in the picture that some have marshmallows and some were made with just icing for “wool”. Grease muffin pan or prepare muffin liners. Combine softened butter, sugar, eggs, homemade vanilla extract, and yogurt in a bowl. Combine cocoa powder, flour, baking powder, and salt in a separate bowl. Fill muffin cups ¾ full. Bake for 20-25 minutes. Cool before Icing. Ice cupcakes and add marshmallows, or if you are using icing to make the wool without marshmallows, pipe icing in wool design. To assemble, add icing so marshmallows will stick. Leave an area without marshmallows in the front for the head. Slice tootsie rolls in half. One half is the head. The other half should be cut into 4 long pieces. Use two pieces for ears and another piece for the tail. Add sprinkles for eyes and nose. Use icing to make the sprinkles stick. This was the tricky part for the kids, but we managed. 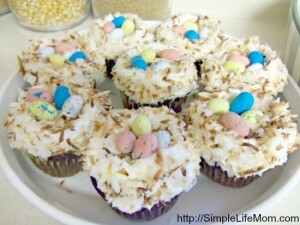 Last year we made Easter Bird’s Nest Cupcakes. They were very simple and a lot of fun. Oh gosh these are wonderful….I am going to make a dozen to send to work with my husband for his co-workers! Well maybe not all of the “flock” will go…we may have a few “lamb” at home! What a great idea! 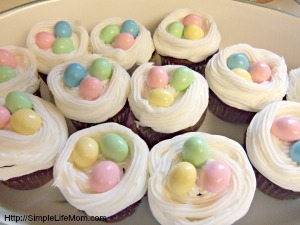 My kids love the look of them, and we plan on making a batch for our Easter dessert this year. Thanks so much! Those are so cute…..adorable. 🙂 Thank you for posting this. Ha ha, thanks. We did have to work on the faces more than anything else. I’m sure yours were great. What a cute idea! You out did yourself with these little sheep! I love them and the ingredients are so healthy. thanks for sharing on Real Food Fridays Blog Hop. Will share on Pinterest & google. These are adorable! Love it! Shared it on my Facebook page. 🙂 Please keep these great ideas coming. This is fantastic! Just the cutest thing ever! I may have to make these for the grandkids! Thanks! These are adorable! Pinning to my Easter board! 🙂 Found you at Sweet & Savoury Sunday! 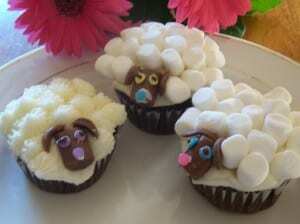 I LOVE your sheep cupcakes!! Your lamb cupcakes are darling – my grand children would love these! Stopping by from Miz Helen’s party. sweet and cute idea for easter. seen it on Busy Monday. What cute cupcakes! The sheep are so fun! I’m featuring this at my link party and pinning! Thanks so much Alexis. We’ll check out your site. These are unreal. How fun and the cutest idea. Thanks for linking to Inspire Me. This will be a feature next week. Darling cupcakes. Love the cute sheep. Pinning away. Oh my goodness those little lamb ones are so cute!